Murderous 1960s Cult Leader Charles Manson Died at 83 in November 2017-Truth! - Truth or Fiction? Murderous 1960s Cult Leader Charles Manson Died at 83 in November 2017-Truth! Charles Manson died of natural causes at 83 in November 2017 while serving a life sentence in the California Department of Corrections. Charles Manson died of natural causes on November 19, 2017, at a hospital in Kern County, California. The California Department of Corrections issued a news release confirming Charles Manson’s death at 8:13 pm. on November 19th. Corcoran California State Prison had held Manson in a protective housing unit since 1989. He would have next been eligible for parol in 2027. Charles Manson has captured the public’s attention since he led “the Manson Family” cult in committing a series of murders in the 1960s. Most notably, the cult murdered five people, including actress Sharon Tate and her unborn baby, in August 1969. Over the years, Charles Manson and his followers have been the subjects of rampant speculation and false or misleading reports. False reports that Charles Manson had been granted parol circled the web in June 2017. Credible reports about pending decisions related to the release of Manson Family followers from prison likely fueled false reports of Manson’s parol. There was also a false report of Manson’s death in September 2018. So, following years of speculation and false reports, Charles Manson died at 83 in November 2017. 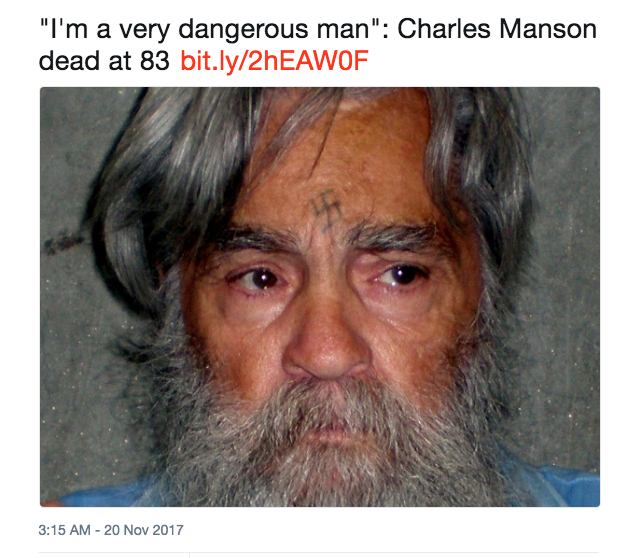 Charles Manson died at 83 of natural causes on November 19, 2017. Partridge Family's David Cassidy Dies at 67 from Organ Failure-Reported as Fiction! 81% of Dollar Store Products Contain Chemicals Linked to Learning Disabilities-Misleading! Picture of American soldier comforting a wounded little girl in Iraq-Truth! Mohammed Bakr Al-Baghdadi Converted to Christianity-Fiction! Muslims Are Meeting to Pray on the Capitol Steps on September 25, 2009-Truth! Rhode Island State Senator Launched F-Bomb at Infowars Reporter-Truth!